Fruko y sus Tesos is a salsa group from Colombia which enjoys immense popularity throughout the Latin American world. It was formed in 1970 by Ernesto Fruko Estrada who modeled it after the New York salsa sound of the Fania All-Stars, one of the leading salsa groups at the time. A favorite of salsa DJs around the globe. Some have referred Fruko y Sus Tesos as Colombia's most important export. Among the group's best-known hits are Pura Candela, Los Charcos, El Preso, Cali de Rumba, Son de la Loma, El Patillero, Tania , Charanga Campesina, Barranquillero Arrebatao, and Cachondea. "El Preso" in particular is one of Colombia's most widely recognized and loved songs. The Cartagenan singer Joe Arroyo joined the group in 1973 and performed with the group for several years before embarking upon a solo career. 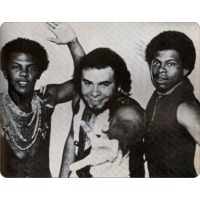 Wilson "Saoko" Manyoma (of Cali, Colombia), formerly of Los Latin Brothers, and singer of El Preso, was also an important member of the band. He has also embarked on a solo career. Some had said that, without Wilson Manyoma's vocals, Fruko y sus Tesos would not have that flavor of Colombian Charanga. Ernesto Fruko Estrada began his musical career at the age of fifteen when he joined the legendary Vallenato group, Los Corraleros de Majagual. It was with Los Corraleros back in 1968 that gave Fruko the first opportunity to travel to New York to witness the city's burgeoning salsa scene.